In 1963, home video recorders did not exist. The only people who could make videotapes were television studios. Most news footage was taken on film (and processed just like a photo film). Hand-held video camcorders didn’t exist! Today, we all know what happens when you fast-forward (“picture search”) a videotape: not only does everyone move quickly, but their actions are much too jerky. When the forgers made the Zapruder film, they needed to use genuine film of the limousine and the people in it, to make it look realistic—they couldn’t just get Warner Brothers to draw cartoons! They cut and paste this genuine film into a new background film of Elm Street. Some changes could be made. They could cut people out and move them around a bit. They could make copies of arms, legs and bodies, and stick them back together to make them perform actions that the real people never did. They could also slow down or speed up any action. You can slow things down by making several copies of each film frame, and changing the “in-between” copies a little bit so that everything moves smoothly. JFK’s wife, Jackie Kennedy, seems to move quite normally. She seems to have been pasted in at a fairly normal speed, coordinated with the actions of her husband. You can also speed things up. All you need to do is delete some of the frames! When the speed-up rate is changing, you need to change some of the frames a little to make sure everything moves smoothly. It takes skill to do it really well. 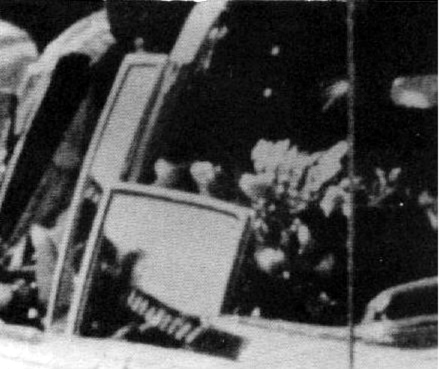 Eyewitnesses overwhelmingly reported that, during the assassination, the limousine braked suddenly and came to a stop, before accelerating away again. Some people have also seen another film of the assassination—not yet seen by the public—which shows this stop very clearly. 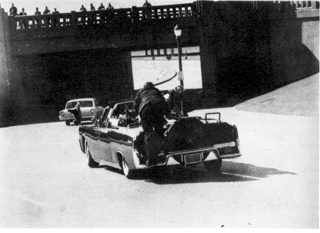 But Zapruder’s film doesn’t show the limousine stopping at all! It just keeps on driving down Elm Street the entire time. The forgers needed to remove all evidence of the car stopping. Not only would it have shown evidence of shots coming from the front, but people would also have asked why the Secret Service agents stopped the car when the President was clearly in danger. It was very easy for the forgers to keep the car moving, by deleting more and more frames as it slowed down and stopped, and then less and less at it started off again. But the four people in the front of the car—the two Secret Service agents in the front seats, and the Texas Governor and his wife behind them—gave the forgers many problems. It was not worth the time and effort to make sure that their motion was perfect, like they had done with JFK and his wife. These other four people would not be the focus of attention. A quicker job of cutting and pasting would have to do for them. When the film frames had been created, these four people seemed to move smoothly enough when looked at frame-by-frame, or in slow motion. But when the film was projected at full speed, there were major problems: “fast-forward” mistakes! We will look at some of these below. The mistakes are so obvious that anyone at all looking at the film at full speed would have known that something was wrong with it! 1. They made it look like Abraham Zapruder jiggled his camera around a lot when he was filming. Whenever someone moves in a way that is too jerky, the whole (pretend) camera was made to jiggle. This makes it impossible to follow the detail if it is being projected at full speed. 2. They made sure that the moving film was not shown publicly. It was 12 years before it was shown on TV! 3. They made sure that the film frames published in November 1964 were black and white, and not great quality. The next danger for the forgers, and those directing them, was that a film expert might “stabilize” the camera jiggles, frame by frame. If this “stabilized” film was projected at full speed, the “fast-forward” mistakes would be obvious! Using modern computers, it has been possible to stabilize the film and put it back together at full speed. The mistakes are now obvious for everyone to see with their own two eyes. You can view a stabilized version of the Zapruder film here on YouTube. You can also download a higher-quality version of it (you might need to right-click and Save As), that lets you move forward or backward frame-by-frame using QuickTime. The clips shown below were originally created in 2003, before YouTube, when computers had trouble showing large video clips full-speed. These clips were created to run at the right speed by doubling up the frames. This does not look as good as the full-speed video on YouTube. We will look at the mistakes in the order that they appear in the film. Some just look ridiculous; others can actually be shown to be humanly impossible, or violate the laws of physics. These have been analyzed scientifically, and shown to be twice as fast as humanly possible, even for an athlete trying to do it as quickly as possible! You might not think that doing something twice as fast as an athlete is all that big a deal. But imagine running a mile in two minutes, or 100 meters in five seconds, or jumping twice as far, or twice as high, as everyone else in the long jump or high jump at the Olympics! Now, as you looked at that last clip, you might have noticed some other weird things. You don’t need to know the laws of physics to know what this means: the car must have braked suddenly at that time. But if you watch the film, the car doesn’t brake at all! Scientists have taken careful measurements of the film, to figure out when the limousine was slowing down and speeding up. According to its motion on the film, it is slowing down for a few seconds before this time! Worse, at the time of the lurch, the car starts to accelerate rapidly! Have you ever been in a car when someone has planted their foot on the gas pedal, and been thrown forward? Of course not! It’s ridiculous! It violates the laws of physics, and it violates common sense. It’s almost like they were nine-pins, designed to fall out of sight! According to Mrs Connally, she pulled the Governor down into her lap to protect him, and according to the Governor he then lost consciousness. They never described both collapsing like this. Worse, if you watch the full MPEG movie above, you can see that the Governor gets back up again, and looks over his wife! In the actual assassination, there would have been several seconds when the limo stopped, and then accelerated again, during which the Connallys would have dropped down to avoid the fusillade of shots reported by eyewitnesses. By removing the car stop, the forgers had to make the Connallys collapse in a way that would be comical if the implications were not so grave. Finally, if you look at the stabilized video on YouTube, and follow Mrs. Kennedy carefully, after she climbs out onto the back of the limo, you can see that she seems to dissolve into the rear seat of the car, and sit on the President's head! The only way to cover all up these mistakes was to make Zapruder’s camera appear to jerk around wildly at these times, and then to make sure that any stabilized film was only ever shown in slow motion. By watching these clips at full speed, you can see through the lies with your own eyes! The fast-forward mistakes ◄ You are here!